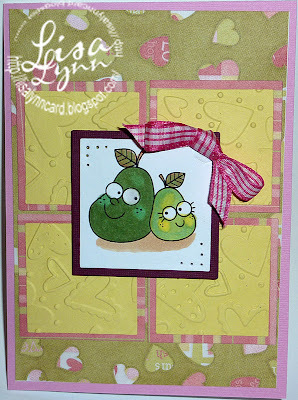 Lisa Lynn created an anniversary card for her parents! Green, pink and yellow... pretty color combo! :) I'm sure that her parents love it!! Here is the link to her blog post. Love her layout, awesome card too! This "pair" is fabulous! Love the embossed sections behind them!